Cloud storage provider Box experienced a snafu early Tuesday when users reported via Twitter that they could not access their stored documents. Earlier today, some users experienced limited access to Box between 4-6am PT. We addressed the issue responsible for the interruption and service is fully restored. We are sorry for the inconvenience, and will continue to make the security and availability of your content our top priority. 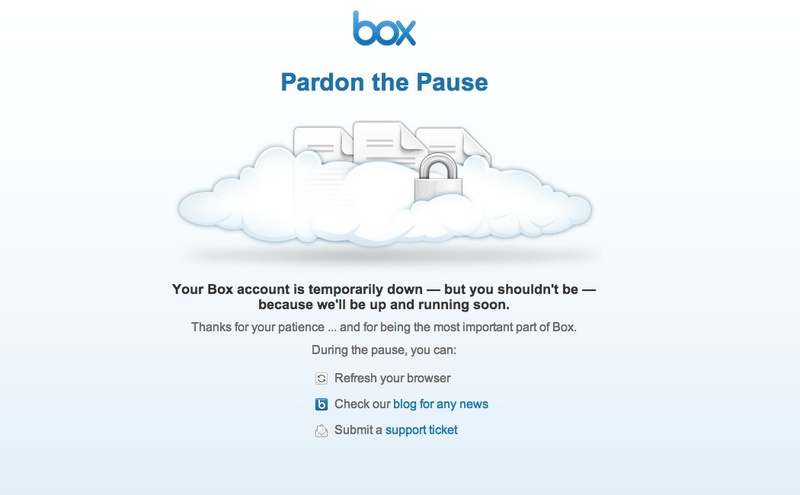 Box is positioning itself as a business-class cloud storage provider, so access problems — even minor ones — are an issue. This is especially true as some IT staffs remain reluctant to move storage and/or compute loads off-premises to the cloud. And given the super heated competition to supply businesses with cloud storage, glitches become fodder for rivals. On-premises storage leader EMC yesterday said it bought Syncplicity which gives it another entry point into business-focused cloud storage. And OwnCloud added versioning support and other perks to its cloud storage management software earlier today. As all these cloud storage startups — the ranks of which also include Egnyte, Accellion, and others — rush to add more collaboration and enterprise features to their cloud storage services, job number one is to make sure that users — especially paying business customers– always have access to their stuff. My 3 cents. Disclosure: Iâ€™m with Huddle, we play in the enterprise content collaboration space. We were alerted to this outage, which lasted closer to 3 hours, beginning at 5:51am ET/ 2:51am PT. I agree that there are things that are completely beyond a cloud providerâ€™s control; servers go down and so do private cloudsâ€”which is why there is redundancy and back-ups such that users never experience a problem. It’s important for all cloud companies to strive to deliver the most uptime possible, and if there’s a downtime event, that our customers know that weâ€™ve done everything in our power to fix it. Huddle guarantees 99.9% uptime (currently 99.97%) and we’ve never missed that target…if we do, we give money back. We also allow anyone to monitor Huddle’s uptime in near real-time. What perplexes me regarding this particular incident is that during the 3-hour outage, Box customers received no communication from the company. I don’t know if that’s because Box hoped that no one would notice, but I must say that execs in two different time zones are woken up in the middle of the night if anything close to an error occurs in our system and we have a procedure in place to communicate issues with our customers. Businesses don’t get to “pause” their company operations when something like this occurs. In Huddle customersâ€™ world of global enterprises working across multiple timezones and state governments, itâ€™s not something a company could afford without repercussions. Most companies that can’t understand how to fit cloud services into their infrastructure are being short-sided or blinded by the past. As a company that runs using several cloud services I can say we have amazing up time. AWS hosting, Google Apps, Dropbox for teams, and many more. We’ve been using most of them for at least a year now with 0 effective downtime. Why people assume that because they are using cloud services they are somehow no longer control is foolish. Even in a small business I’ve crafted failure plans for all cloud services we use, and I’m happy to say I can accomplish 0 downtime for many orders of magnitude less money than these naysayers because I leverage the cloud, but maintain a local mirror. We use dropbox in our case rather then box, but it goes the same. In the case of downtime our file server would continue acting as it normally does, and we would no longer be syncing to dropbox, after a few hours the server would automatically rsync itself to our backup server offsite. The local copies would continue to sync as they normally do, and life goes on. When dropbox comes back up it would see the changes and update. The total cost of this solution is merely $2000, and we have speeds as fast and reliability as high if not higher then most enterprises. Okay, I’ll bite. I’m with Accellion and we happily offer a public cloud deployment, but the majority of our customers prefer to use a private cloud deployment. It’s because of events like this, and organizations wanting to keep their data under their control. Public cloud is cool and everyone wants to do what the cool kids are doing, but if your business depends on uptime during business hours, having it under your control, at least for now, is what most organizations want. >> Box is positioning itself as a business-class cloud storage provider, so access problems â€” even minor ones â€” are an issue. Barb – I feel like tech writers feel obligated to make this statement. It gets repeated each time a big provider has an outage and just perpetuates the myth that there can be a service with no downtime (impossible) and the myth that somehow the winning companies will have no downtime (impossible). I think writers should be more intellectually honest and just leave this statement out of their writings. you are right — we are obligated at this point. esp. because we keep hearing from the buying side that there’s FUD about cloud. Maybe in a few months we can stop…. i feel your pain.